Peter Lombard (born in Lombardy), was a student and then teacher in Paris, where he became archbishop shortly before his death in 1160. He wrote a number of commentaries and theological works in the 1140s-1150s, including his commentary of the New Testament letters of St. Paul, which became a standard text throughout the rest of the Middle Ages. The title on this spine of this volume, no doubt copied from the former binding, states that it was owned by the Franciscan convent in Canterbury. 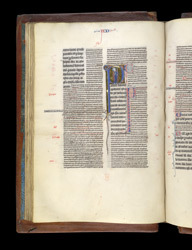 The text on this page is the end of the Epistle to the Romans and the start of I Corinthians, headed by an illuminated initial containing an image of St. Paul. The biblical text in large script, written on alternate ruled lines, and the commentary is written in small script, on each remaining ruled line. Quotations from the biblical text within the commentary text are underlined in red, allowing a reader to cross-refer back and forward between the two: arguably this is an early form of hyperlink.